Picture this: Sunday morning under the covers with your boo. It’s warm under the sheets and you’ve had a festivenight. It’s a cute and cuddly scene until your stomach starts growling. Don’t fear pancakes are the pièce de résistance to a comfy Sunday morning with your boo. Here are a few simple recipes that will taste great and keep that warm, fuzzy feeling going. First, start with some instant pancake mix. It can be the kind where you just add water or the “oh you fancy hunh” mix that calls for eggs and oil as well. These recipes are all simple and will be a cinch to whip up in the small confines of your dorm’s kitchen and with your limited college student budget. Sweet potatoes are becoming popular showing up as fries, cupcakes and other desserts. They also make great pancakes. Take a can of sweet potatoes, mash them with a fork, add some sugar and about a cup of water to the dry pancake mix and voila… Sweet Potato Pancakes. These pancakes are also perfect for Autumn, bringing to breakfast one of the best flavors of the Fall season. Ever heard that song “Banana Pancakes” by Jack Johnson? It’s perfect for a rainy morning with your main squeeze. 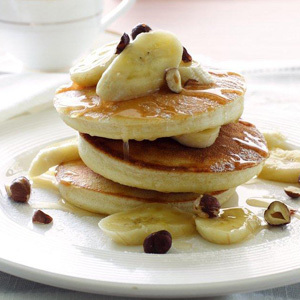 Cook up some delicious banana pancakes and whether its raining like in the song or not, there won’t be any desire to go outside. Just mash up some banana and mix lightly with the dry mix… then add slightly less water than you normally would. Take it to the next level by adding some pecans if you have them around. You can even top these delightful treats with ready-made caramel. For the pancake mix that requires eggs and oil you can use one a snack cup of applesauce instead. The apple sauce with cinnamon really kicks the pancakes up a notch. The apple-cinnamony flavors are also a stellar ode to the Fall flavors palette. Pair one (or more) of these super-easy recipes with some turkey bacon, eggs, and a tall glass of orange juice and head back to the bed. Your cuddle buddy will not only commend your spooning skills but your culinary one’s as well.